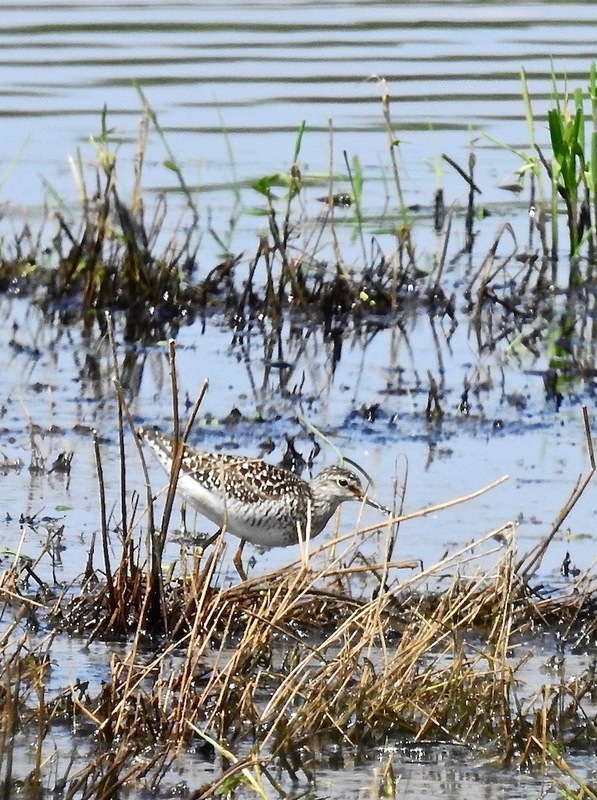 Against better judgement, football fixtures, soaring temperatures and blue June skies, I headed out to the marsh for an hour or so this afternoon. The heat shimmer was wibbly wobbly enough to make white cows look like sleeping Spoonbills (well, almost), but the fitba meant the road was reasonably quiet. 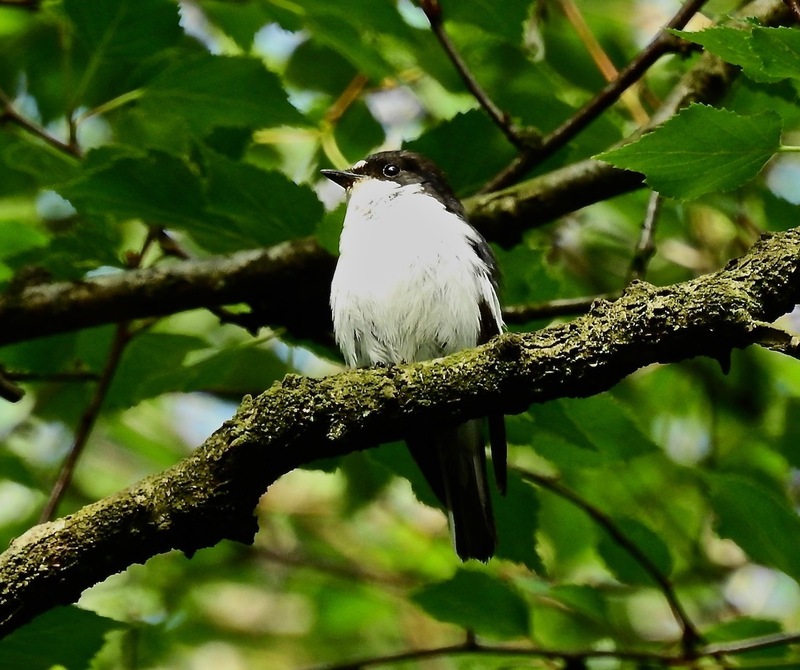 Despite the shimmer, good numbers of Swifts were zooming around low over the outer marsh between Marshside and Hesketh Road, and the addition of House Martins from the estate added to the sense of exciting hyperactivity. The futility of trying to get a picture of one was hugely entertaining. 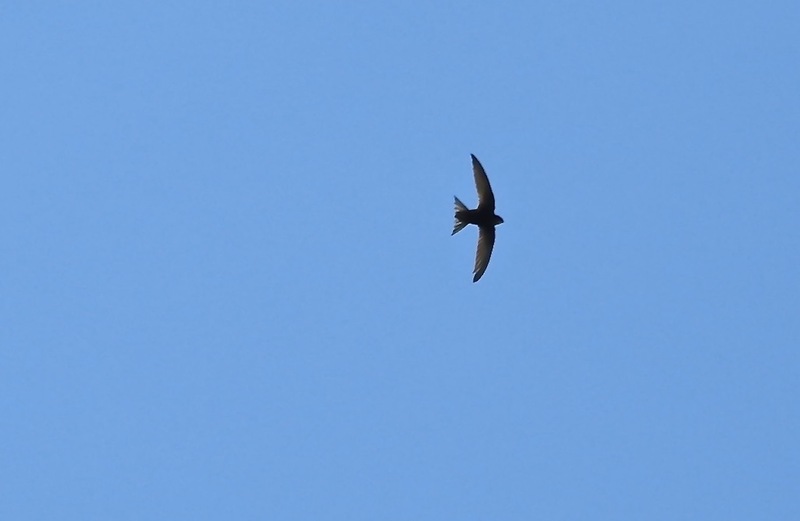 Final tally = 54 pics of blue sky, 4 blurry pics of Swifts. I think the Swifts won, but they had velocity (and my ineptitude) on their side. Probably 50-70 of them hawking about – not that many I suppose, but more than I’ve seen together so far in this strangest of years, so worth the walk down to Nels. 28 Dunlin and a Knot amongst the Blackwits and Avocets down there, before a dread (presumably a Peregrine/Sprawk passing over high and invisible from the hide) scattered everything. A visit to Egret Island. 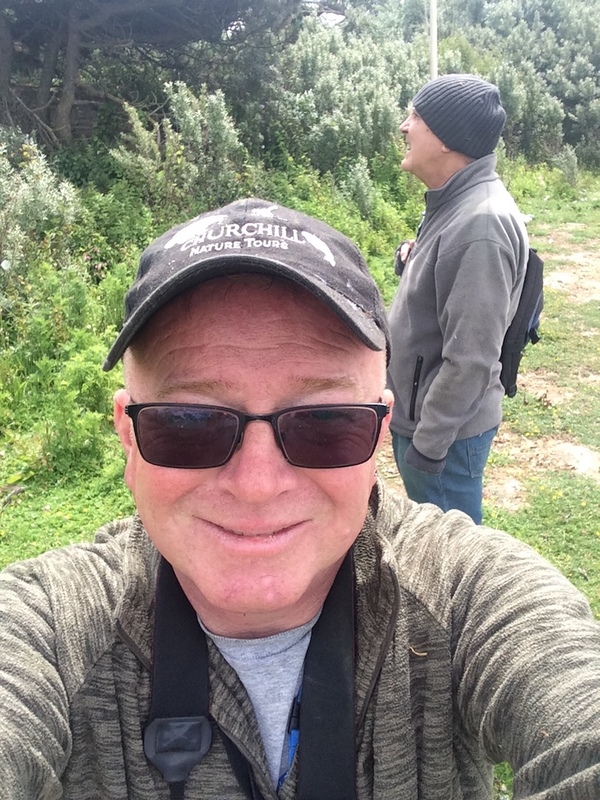 It was a question worth pondering as I crawled on my belly through a fetid carpet of fresh goose droppings, dried musty egret guano and many more unmentionable things on the island on Southport Marine Lake this afternoon with Pete Fearon Snr. 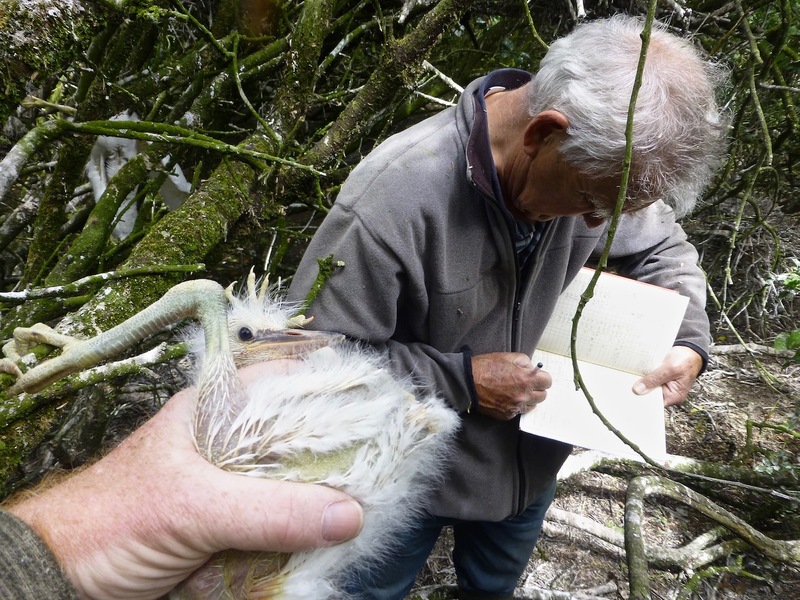 Pete, of South West Lancs Ringing Group, had asked about ringing the young egrets in the growing colony, so wearing my new Green Sefton engagement officer hat (now liberally coated in egret poop) I contacted the lake operations manager, Steve Irwin, and lake concessionaire Colin Poole, who were happy to help out. We visited this afternoon more as a recce than a full on ringing exercise. 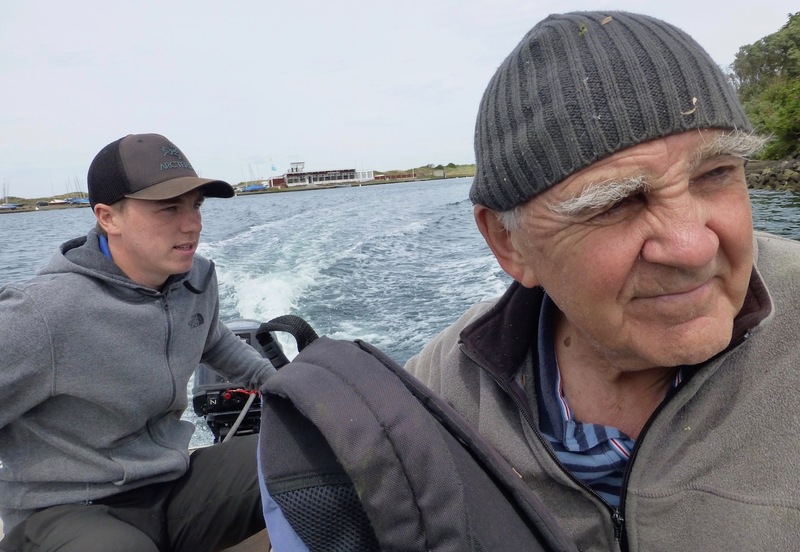 Once dropped off by boatman Elliot (thanks Elliot!) 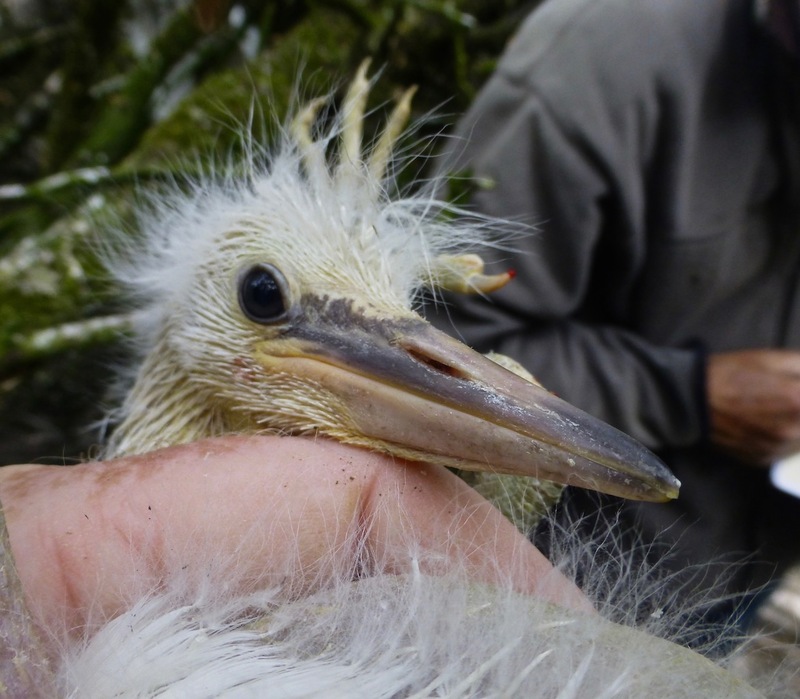 it was clear that at least 20 young Little Egrets had fledged already, and were not going to be particularly approachable. 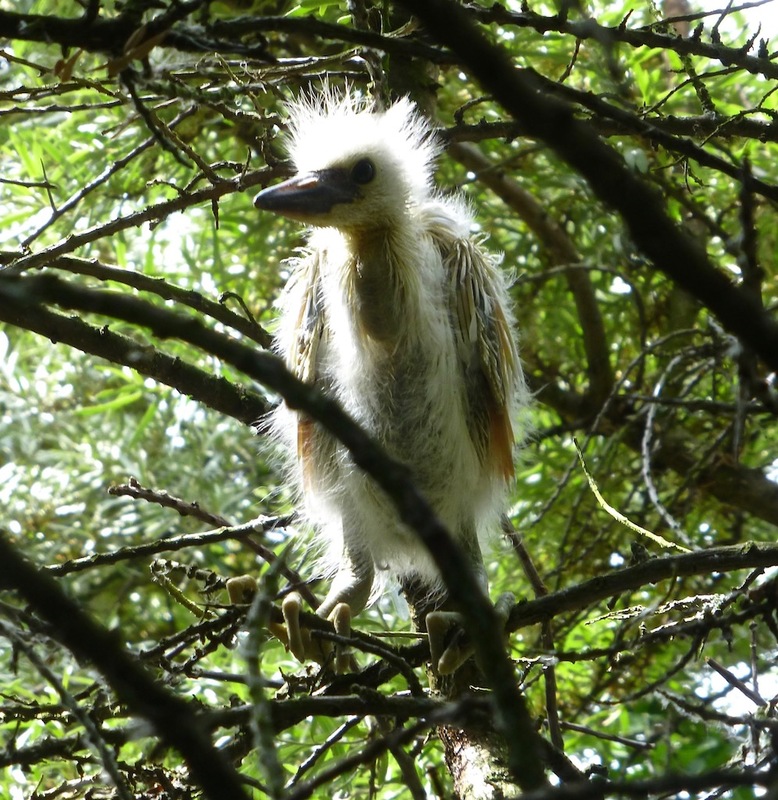 They peered down at us with adults from the canopy as we tried to push through the scrub to the centre of the island, where several nests (given away in the tangle of branches by the white spattering of random Little Egret latrines), still contained unfledged young. We ringed four of the youngsters. Should anyone come across them in the future, the ring sequences are GV52570 thro’ to 73. 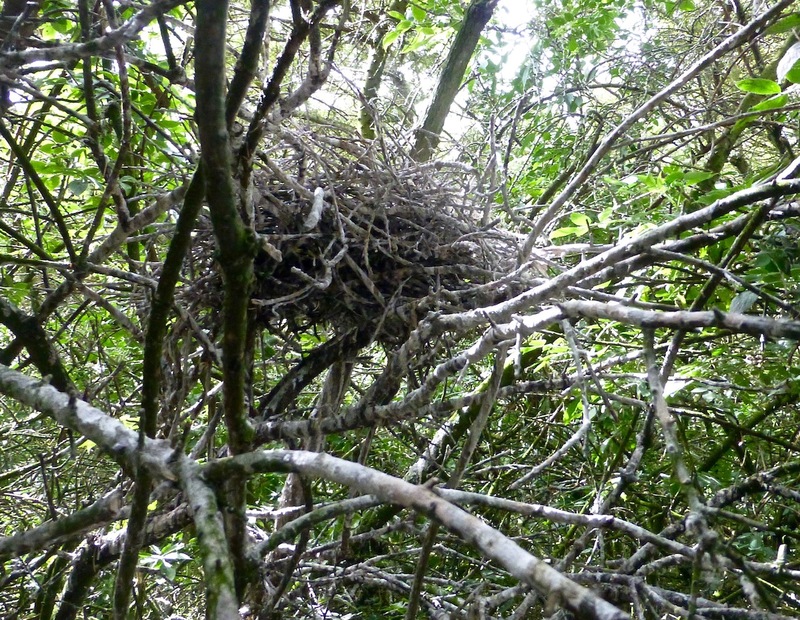 There were numerous nesting platforms in the dense Sea Buckthorn scrub – possibly as many as 30, but many were unoccupied. 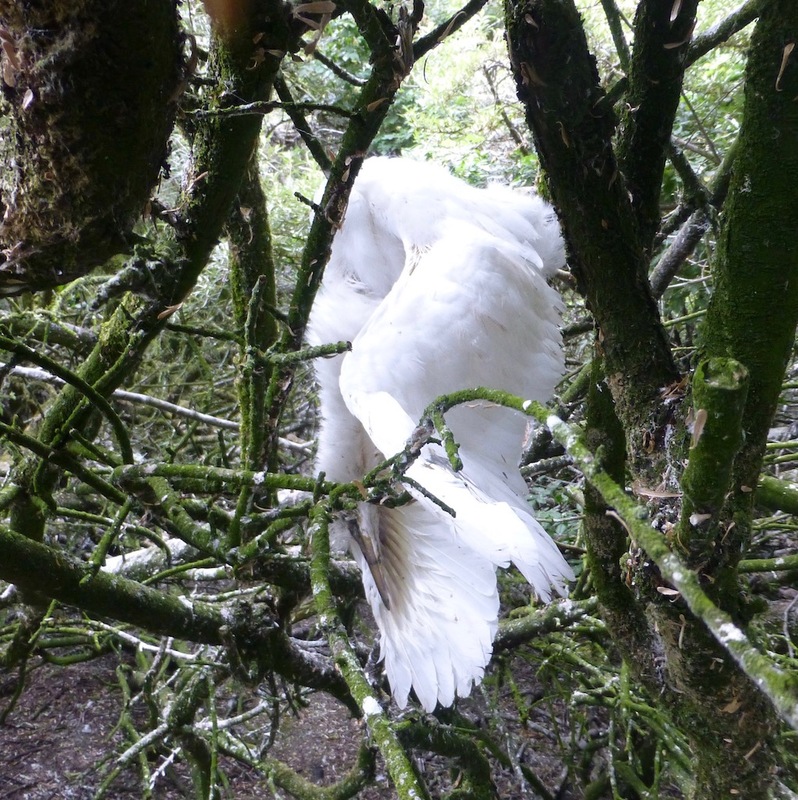 What was surprising was the number of dead egrets – at least 11 were hanging from the branches or on the floor of the central part of the colony. 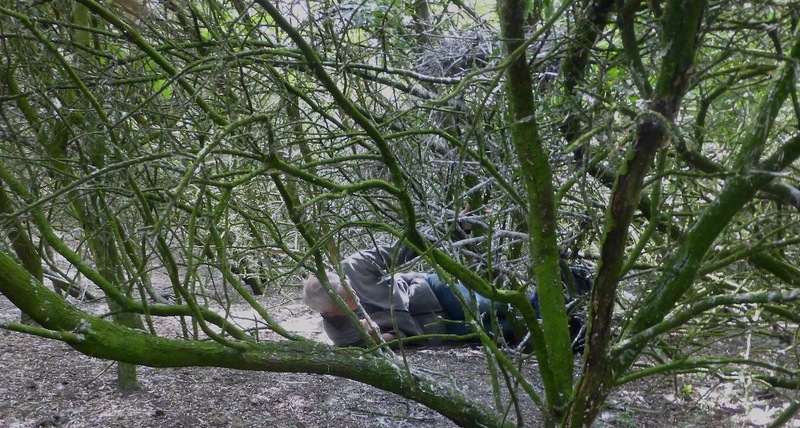 It was hard to say what had caused the mortality – there was no obvious sign of injury on the bodies, some were nearly fully fledged, others much younger. Perhaps the high winds last week had blown them out of the nests? 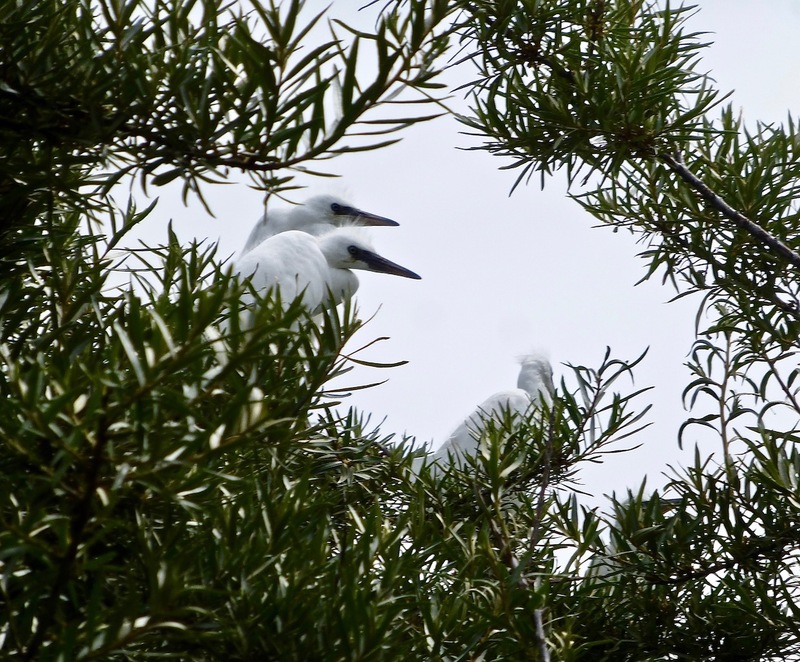 The dense vegetation meant it was not possible to walk to the top end of the island, where many more egrets were perched up, so the most accurate means of assessing overall numbers in the colony remains counting from the Prom with ‘scopes for the time being. 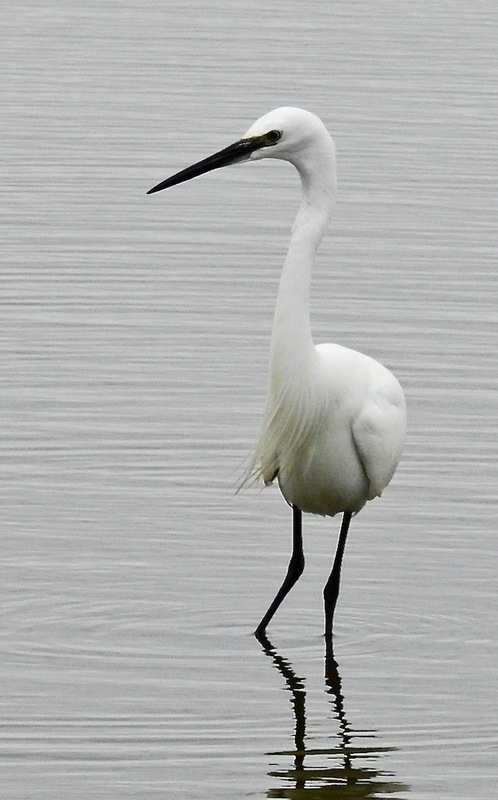 That said, today’s visit will hopefully lead to a wider programme of work with the egrets – more details on that in the future, but after an hour or two it was time to organise our escape from Egret Island aboard the good ship Very Small Indeed…. The distant, motionless Spoonbilly white blob on Polly’s Creek was all very well, but it was hardly pressing the buttons in the enigmatic stakes at Marshside this afternoon, so I walked down to Nels. 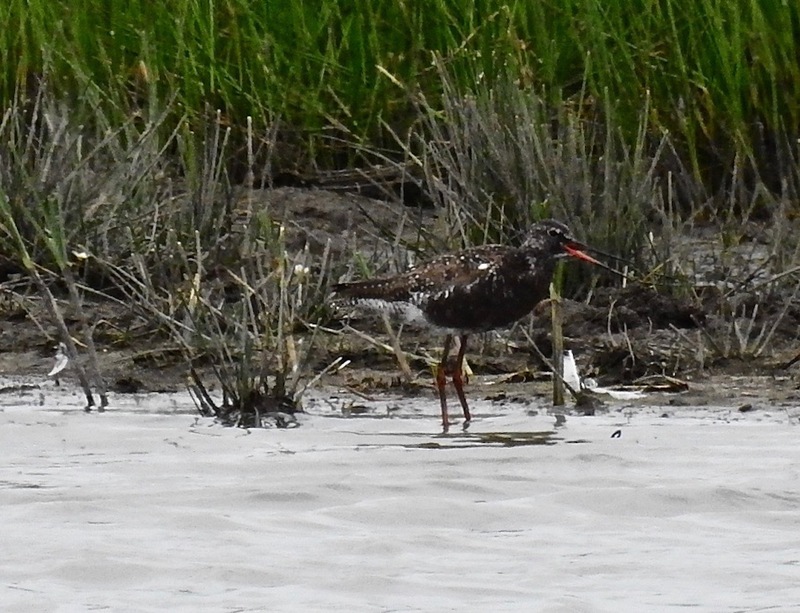 The fine Spotted Redshank was at the back of the lagoon still, feeding at one million miles an hour. 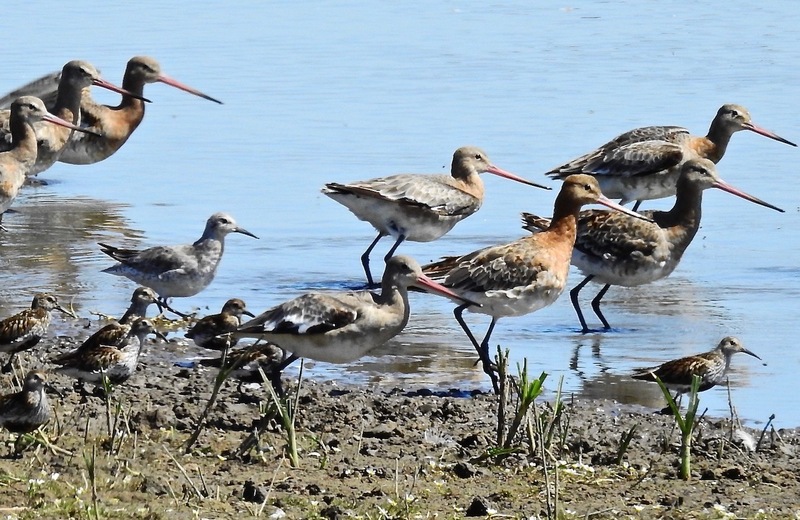 The bird caught plenty of small fry at twice the wading rate of the Blackwits that surrounded it. It moved so fast through the shallow water that it almost left a wake…obviously very hungry. 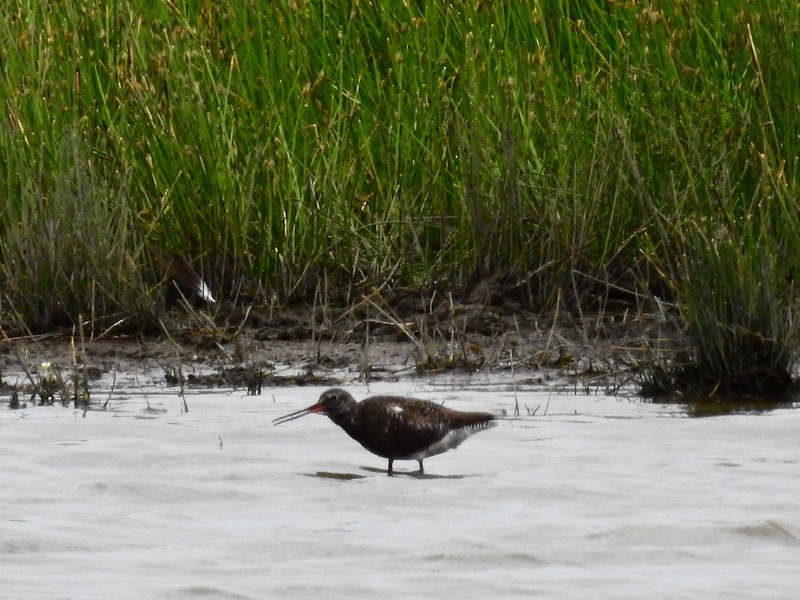 At least 150 Blackwits on the lagoon with a breeding plumage Ruff still and noisy Redshanks. 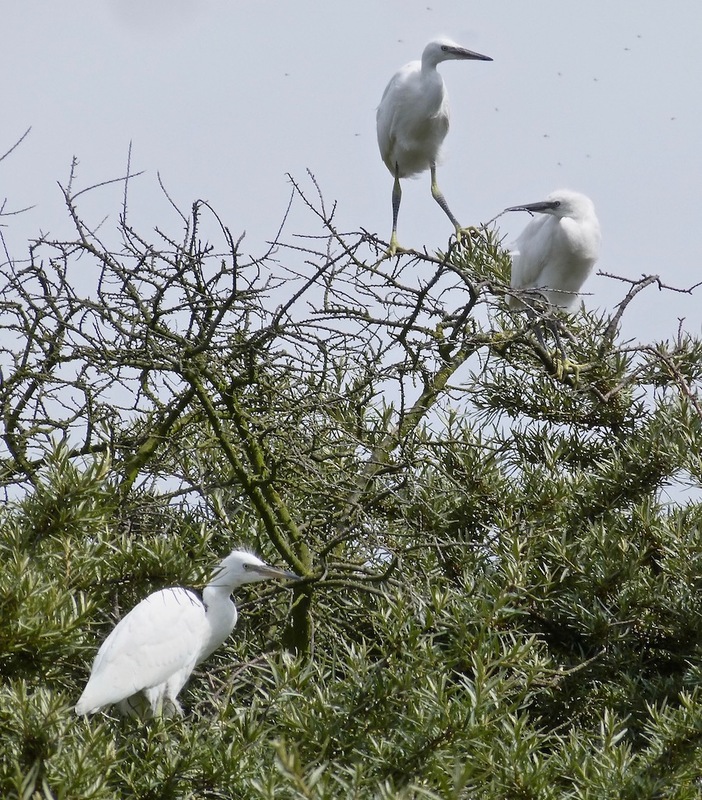 14 Little Egrets were hissing, barking and croaking like extras from “Jurassic Park”, often only feet from the hide as they waggled their legs in the mud to disturb prey. 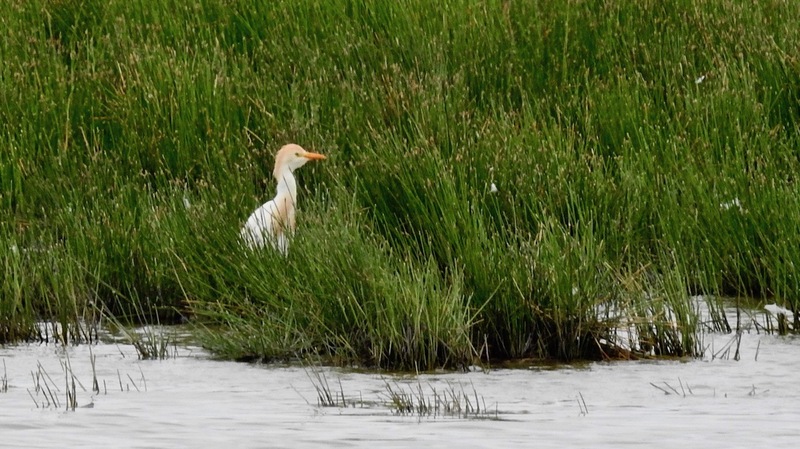 Their stubbier, but far more characterful cousin popped up in the sedges at the back of the lagoon, looking summer dapper – has anyone seen more than one Cattle Egret recently? Sand Martin amongst the House Martins above the pool, and hunting Peregrine and female Sprawk, but apart from the hyperactive SpotShank, it all felt rather sleepy summery…time for cold beers and footy. 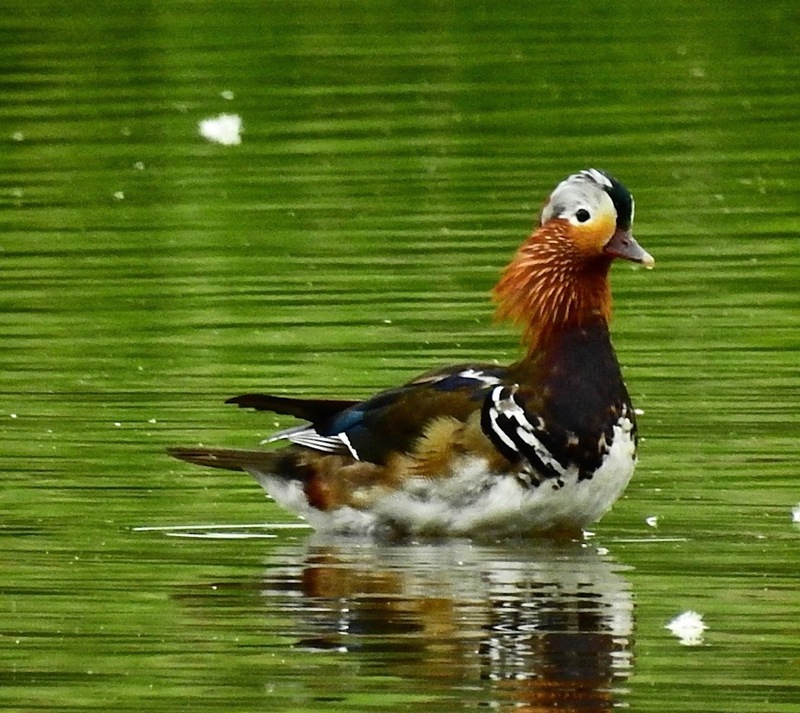 When the dazzling colours of a drake Mandarin are starting to look a bit ragged we’re certainly heading into the quieter weeks of bugs and plants. 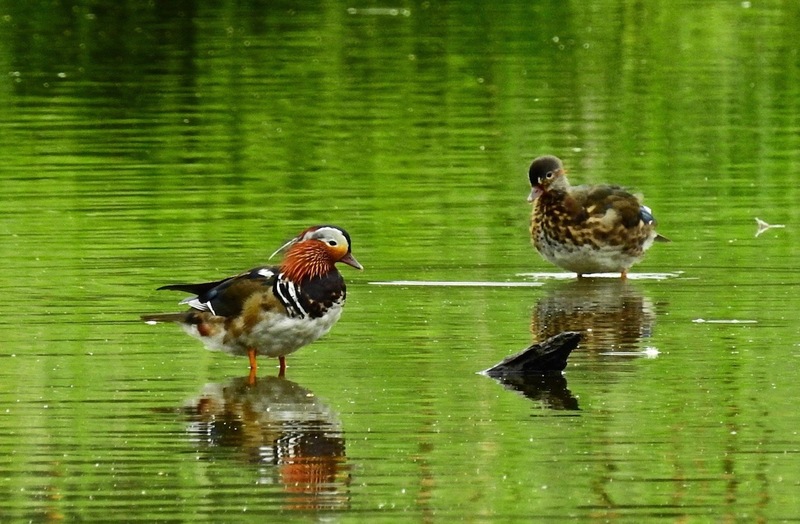 Two Mandarins were out on the green waters at Mere Sands this afternoon as Kingfishers hurtled about the edges of the lagoons, and the woods held Treecreepers, Blackcap, Willow Warbler, Chiffchaff, Gtr ‘Pecker, but oddly no Nuthatch as I wandered about (one was calling at Ainsdale Station yesterday and at Dempsey Towers this morning, but hidden by the summer canopy). 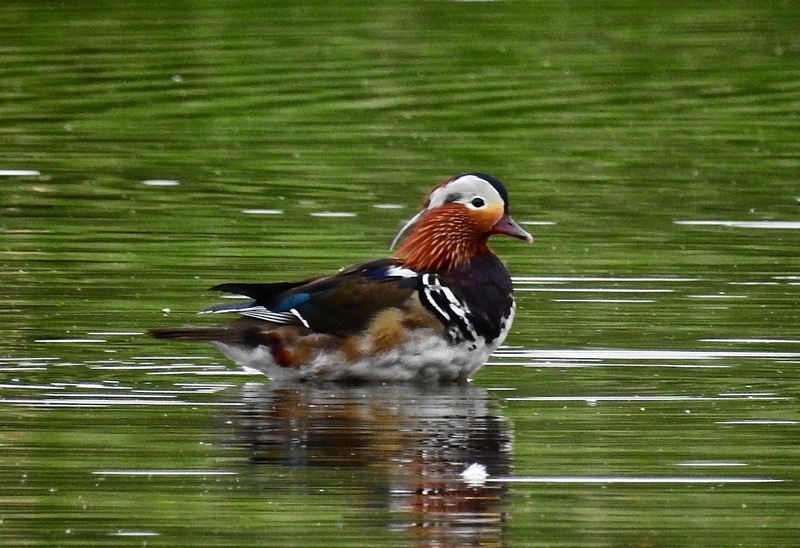 Another Mandarin was lurking under the overhanging branches from the Redwing Hide this afternoon, and Common Terns chased off over-curious Herring Gulls and Lesser Black Backs. 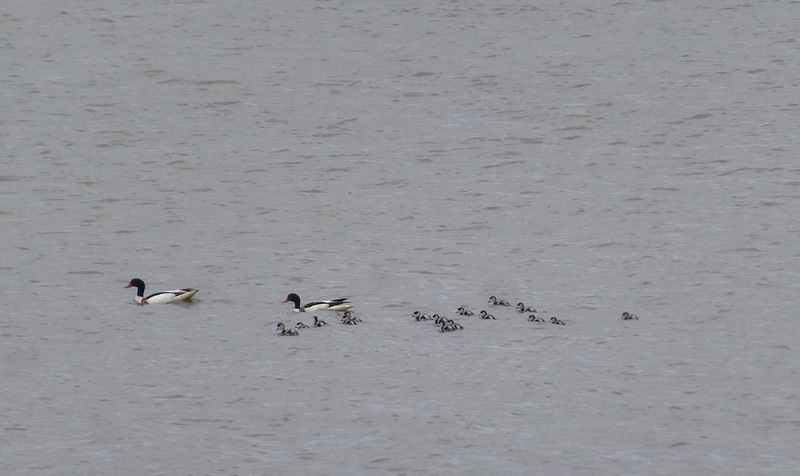 Yesterday on a guided walk through the dunes at Hightown, two Groppers were still reeling and three flotillas of Shelduck young were out on rising tide on the Alt estuary, although gulls were picking off any that got separated from the safety of the brood. ‘Crested the bridge over the Hodder long before the morning mist had started to burn away. 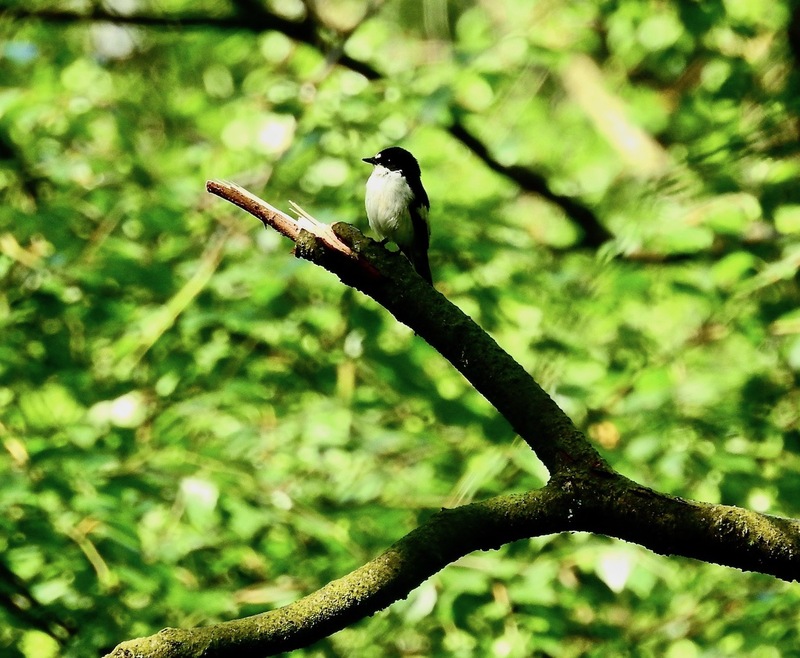 A few minutes later the Pied Flycatchers were calling in the blissful dawn green as I turned the ignition off. 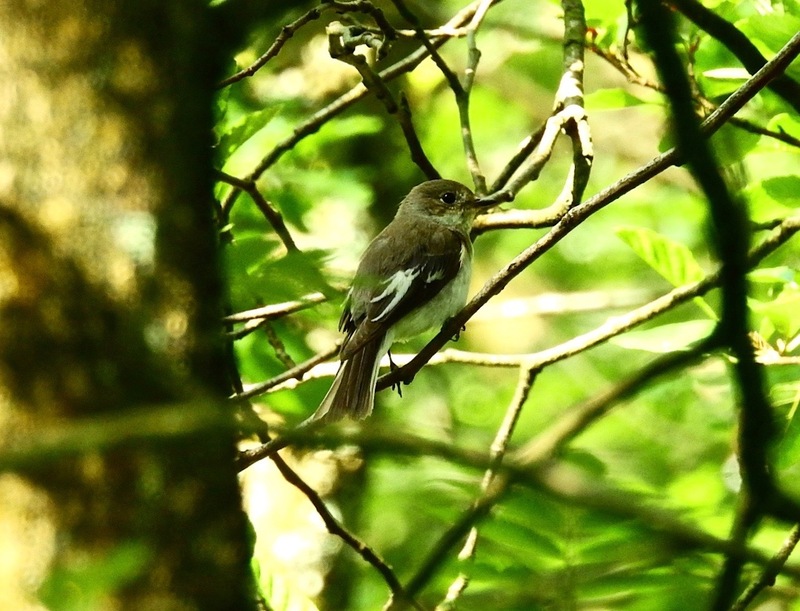 There’s something reassuring about a place that doesn’t change, and I hope Moor Piece remains Lancs’ Pied Fly breeding ark for many years to come…and of course that the species can reclaim other sites. A gorgeous and peaceful reserve, I had it to myself for an hour or two this morning, as Pied Flys, Jays, Greater ‘Peckers, Siskins, Nuthatches and Willow Warblers zipped about the pocket of East Lancs woodland. 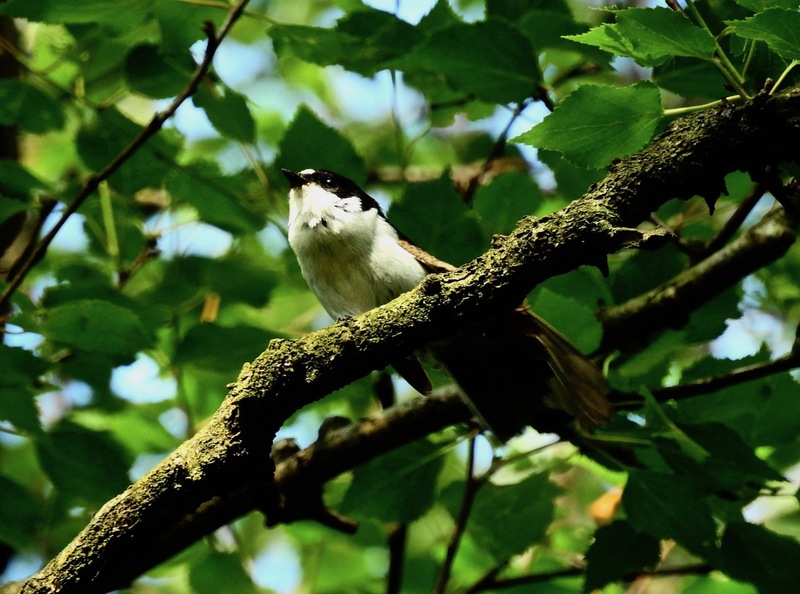 The Pied Flys were as obvious and noisy as ever – fantastic wee things, two males were in my face pretty much constantly as I strolled along the road, but I reckon I had at least three different birds around the road junction. Sometimes you need a few hours as precious as these, but by 0930 the lycra-clad horde started to drone through. 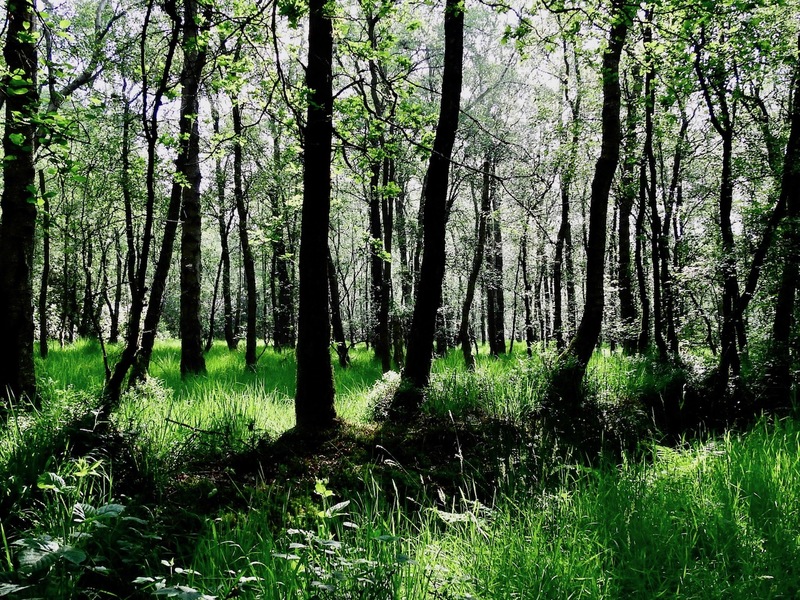 They weren’t doing any harm of course, but the Sunday-pumped lurid skin tights and relentless hum of tyres on tarmac effectively shattered my forest bathing green sanctuary vibe and by 10am I hopped back into the wheels and drifted down to the coast. “I were right about that saddle though”. 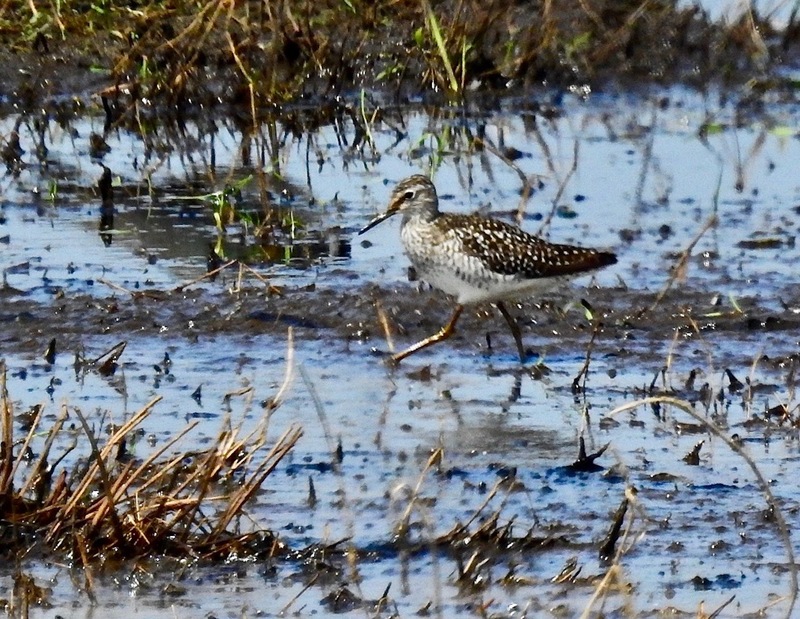 The Banded Demoiselles and Black Tailed Skimmers zooming about the parched pathways at Lunt were undeniably elegant and sparkly this afternoon, but the Wood Sand feeding on the the lagoon just north of the new “Garganey Screen” without doubt beat them in the spangly stakes. 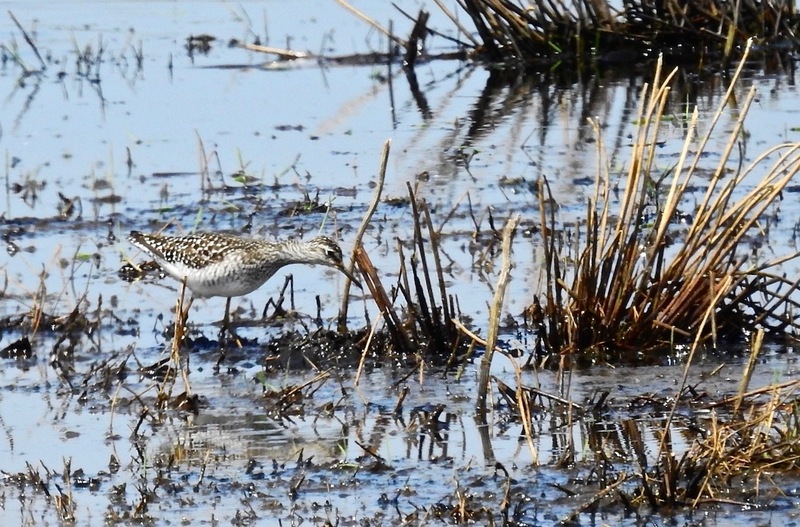 A bit distant at times, but the sandpiper staved off the summer lull for a short period at least, although this marvellous Lancs Wildlife Trust reserve certainly had that “wilting in the heat ” feel to it today. 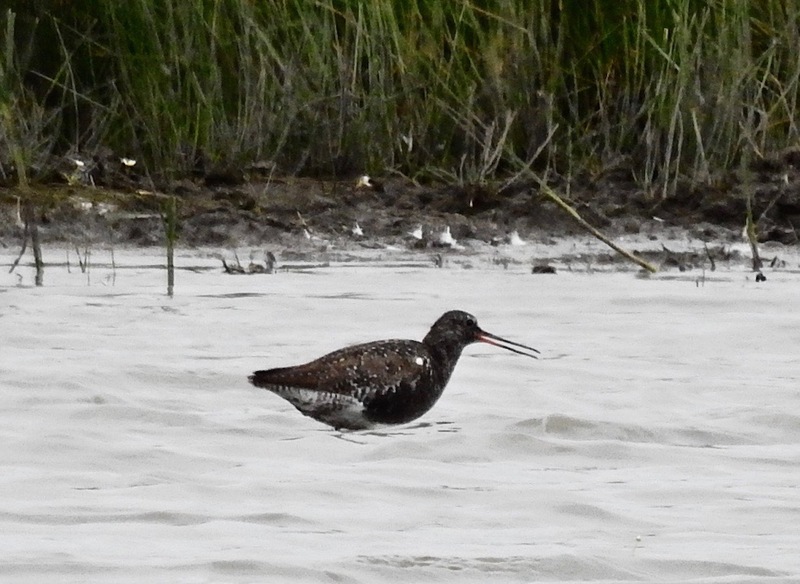 Watched the wader scampering about with Tony Conway for 45 mins or so, and then headed home to cool off. 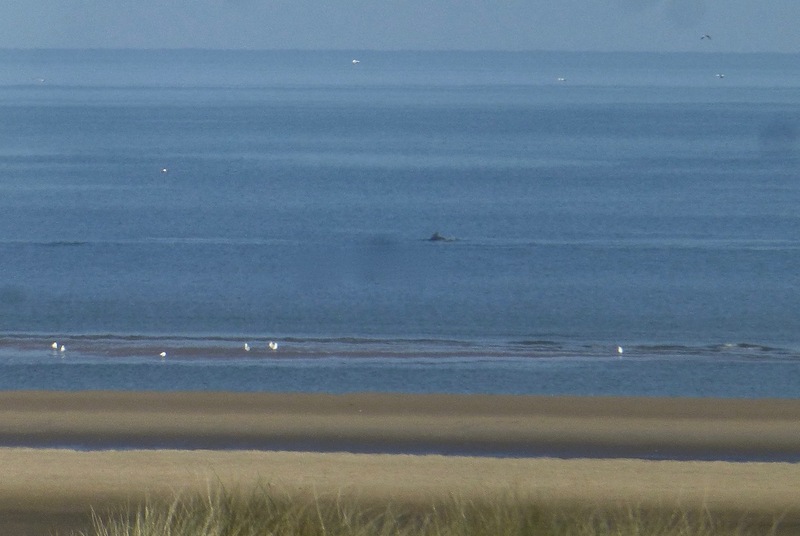 Yesterday three Bottle Nose Dolphins were a bonus, breaching and feeding off Ainsdale for 20 minutes or so just after 8am. The water was so calm the cetaceans were obvious to the naked eye as soon as I got into the tower at work. 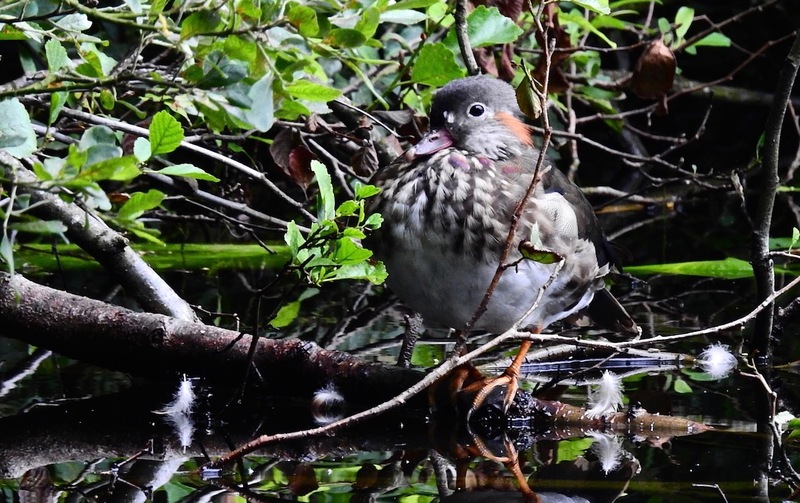 Not as spangly as a Wood Sand, but still good. Adrenalin rush of the day (not counting the panicky moment when I twigged I’d been speed-gunned by a traffic cop on the way home – fair do’s I was bang to rights) was the Hobby that scorched past the office window at Ainsdale at about 1pm today. One had rocketed through yesterday, but it was history by the time I’d registered it. I saw today’s falcon coming though from about 300m away and had a bin-ful as it whizzed past just a few feet distant through the glass, all red troosers and black moustaches. 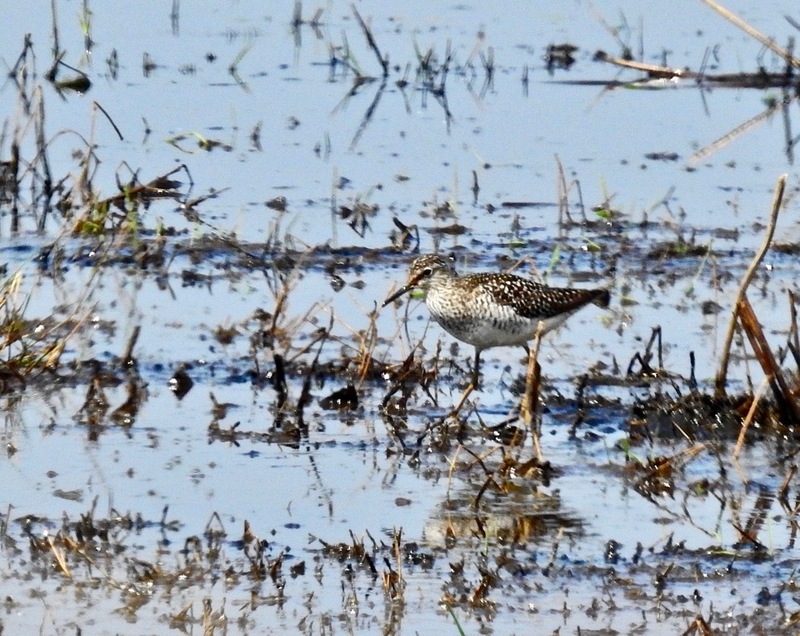 Later in the day Phil Smith dropped by having been watching Hobby bait all afternoon. Not any old Hobby bait mark you, but three superb Red Veined Darters around one of the larger fenced Natterjack pools south of Shore Road. Phil explained David Tyler (BHD) had seen Red Veined Darters there yesterday afternoon, so I scooted down to the area in the warm evening sun. 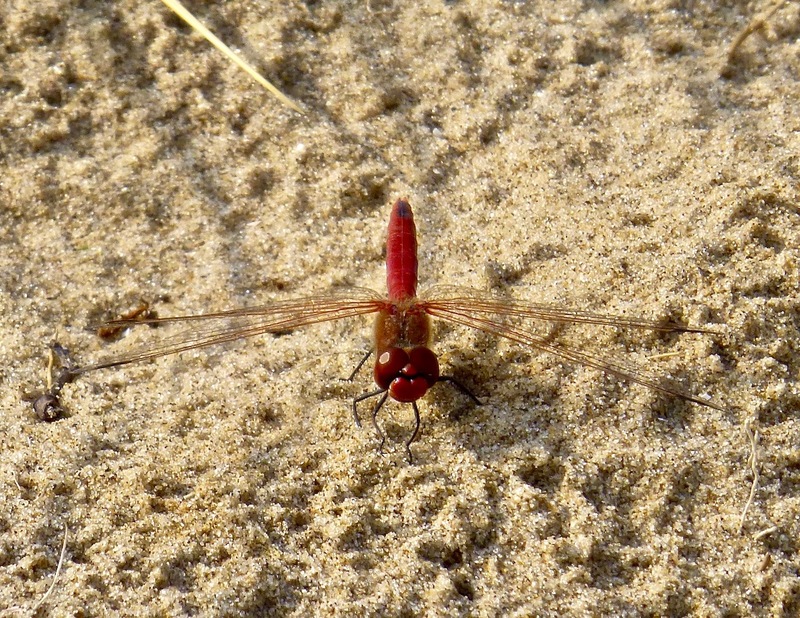 At least two ruby red Red Veined Darters were resting on the sand outside the fenced pool (Slack 169d for those who know the slack numbering system), and Broad Bodied Chasers, Emperor Dragonflies and Black Tailed Skimmers rattling around over the water. The sun was a bit low to get great pics but I managed one reasonable head on shot of those lovely red eyes. On the walk back to the office I saw another Red Veined Darter perched up in the south west corner of Slack 170. Thanks for the tip-off Phil, and thanks to David Tyler too!